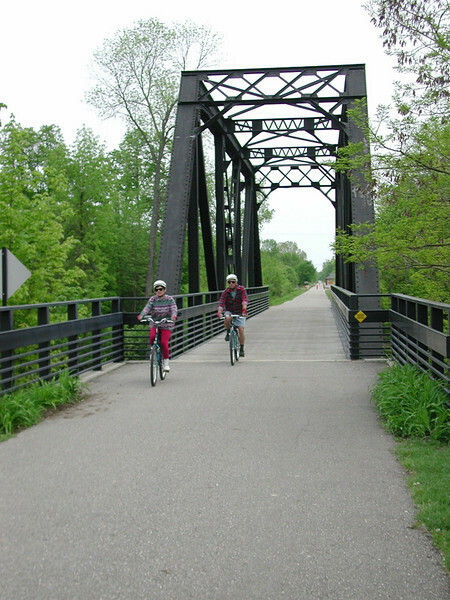 Running through a 30-mile linear park constructed on an unused rail corridor, the Pere Marquette Rail-Trail connects Midland and Isabella Counties and multiple cities. The trail offers walking, running, bicycling and in-line skating opportunities to people of all ages. In addition to its recreational benefits, the trail provides a safe alternative means of transportation for local residents traveling to and from work and area shopping districts. Twelve TE awards received between 1992 and 2010 financed the construction of the trail, improvements to watersheds, and a case study. The projects received over 4 million dollars and were matched by another 3 million in local matches. Nearly 2 million dollars in American Recovery and Reinvestment Act funds were also used. The initial award created a three mile trail through Midland. Over the ensuing years, Midland and Isabella Counties and the city of Midland used additional TE money for the construction of trail extensions and the paving and resurfacing of the trail. In recent years, TE money has been used to add lights, trash cans, benches, retaining walls, and to extend the trail even further.